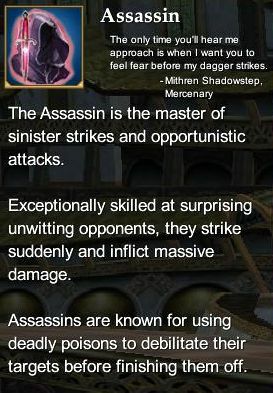 The Assassin profession is ideal for those who wish to master sinister strikes and hidden attacks. The Assassin serves his party best in the frontlines of combat. He surveys the battle for potential prey and attacks of opportunity, striking from the shadows to inflict massive damage. Assassin Epic Weapon Series (80) - Rise of Kunark Assassin Epic Weapon. This page last modified 2011-08-25 22:52:16.